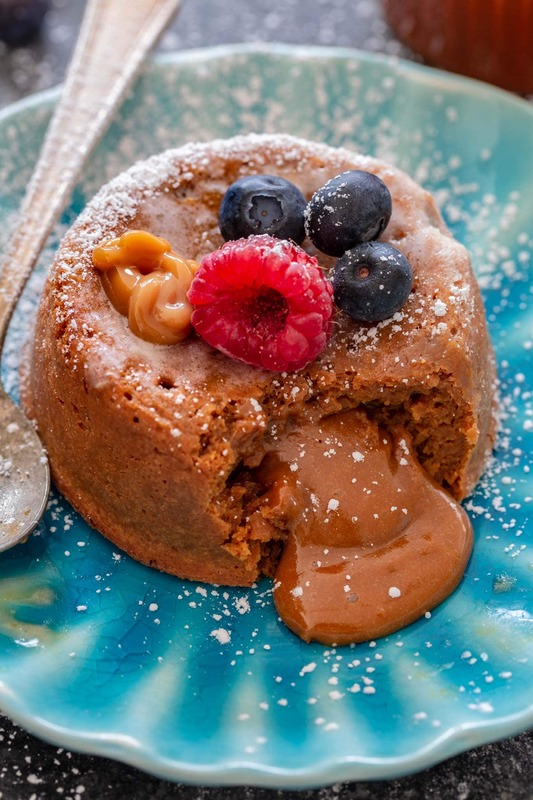 It is mind blowing that something so easy can be as impressive as these Molten Dulce de Leche Cakes! Just a handful of ingredients create one of the most decadent desserts ever invented. The warm dulce de leche oozing out of the cake is pure magic! Molten cakes are one of the most popular desserts down in Brazil, where they are called “petit gateau“. Every restaurant serves a version, with chocolate being the obvious choice most of the time. That is, until you try the dulce de leche version! Oh my goodness, you guys. I can’t begin to describe the feeling of cutting through one of these and watching the thick caramel-y goodness flowing out and waiting – no, begging – for you to scoop it out and taste it. And once you do, it is like eating love! For realz. I know what you are thinking. I get way too much happiness from good food! But life is short and we deserve to treat ourselves every now and then. Especially on Valentine’s Day! Molten cakes – also known as Lava Cakes – are so freakin’ easy to make! 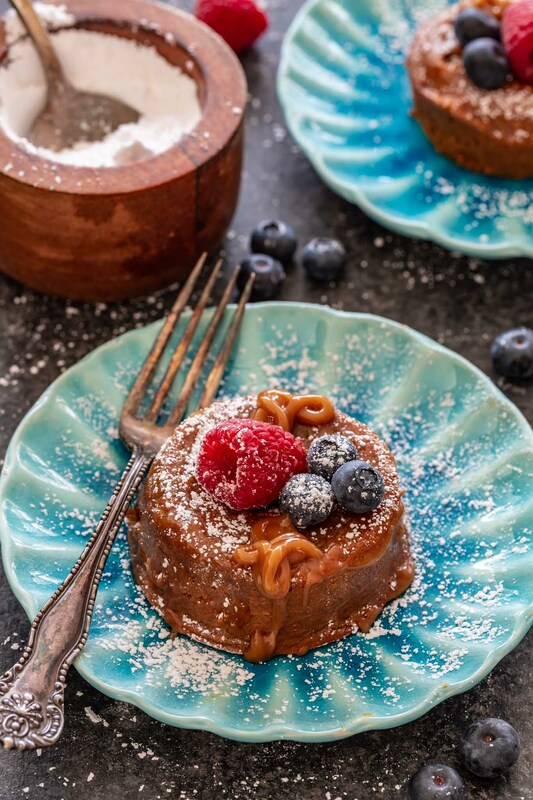 You’ll need one bowl, one whisk, ramekins (or a muffin pan) and five simple ingredients: dulce de leche, eggs, very little flour, salt and vanilla extract. Whisk all the ingredients gently – as we want pillow soft cakes – and bake in a hot oven for around 15 minutes, or until the sides are set but the center is still jiggly. Let them rest for a minute, flip them into individual plates and voila! Ooey gooey molten cakes are ready to be devoured! I know I titled this recipe as being “for two”, but depending on the size of the ramekins you use, you can end up with 3 or 4. Well, in my world that still means for 2, as they are so delicious you – or your Valentine – might want to go for seconds. You can also refrigerate them before baking and eat the extra ones the next day, when nobody is looking! And, if you want to make these for more than two people, this recipe is easily doubled or tripled! While you might be tempted to think dulce de leche and caramel are the same thing, they are actually very different. 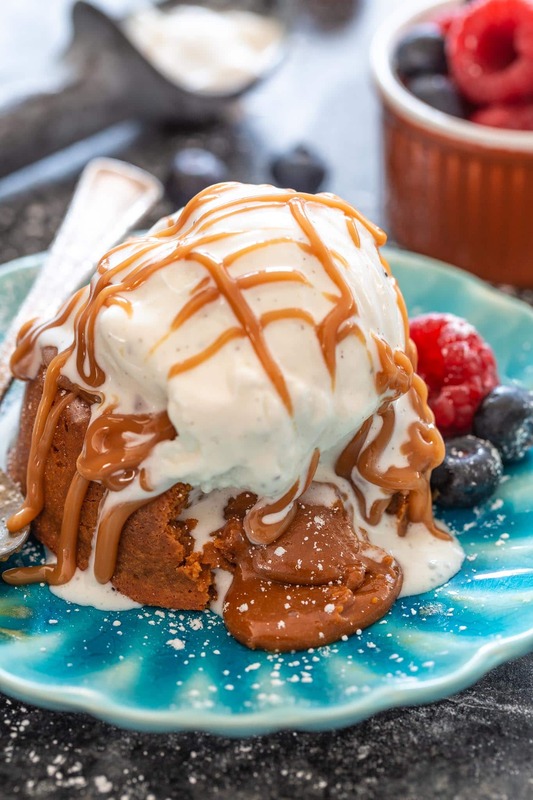 Dulce de Leche is a confection based on the Maillard browning of dairy, while caramel comes from the caramelization of sugar. Dulce de Leche translates from Spanish to “sweet made from milk” and it comes from South American countries, with taste and texture varying slightly from country to country. Legend has it that it was discovered by accident in Argentina, where a forgetful maid was cooking milk and sugar when she was unexpectedly called away. Upon her return, she discovered that the milk had transformed into a rich brown sauce, aka Dulce de Leche! There are several ways to make homemade dulce de leche. The original, which requires you to slowly cook milk, can take up to 8 hours. Because of that, lots of people start with a can of sweet condensed milk instead, which drops the time considerably (to 2 – 3 hours). In Brazil it is common to cook the sweet condensed milk can in the pressure cooker and that takes anywhere from 30 to 50 minutes, depending on the color and consistency desired! You will find a variety of methods and recipes with a quick Google search. 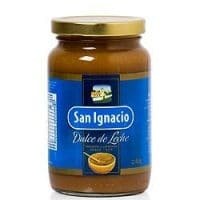 However, chances are you will be able to find canned dulce de leche at your local supermarket. If not, Amazon has a few options for you. My recipe is so simple and foolproof that, unless you over bake the cakes until they look like bricks, they will still be delicious. Do not over mix the batter once you add the flour! 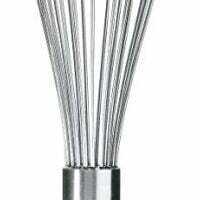 You can be vigorous and whisk until smooth, but once you add the flour, I recommend you gently fold with a wooden spoon. The reason for that is that we do not want gluten to form as that will make the cakes dense and tougher and we want delicate and soft. The fresher the egg, the better the flavor. If your cakes taste and smell egg-y, it is probably because your eggs weren’t fresh. Grease and flour your ramekins really well. You want them to pop out easily when ready to flip! There’s nothing more upsetting than baking a beautiful cake and then have it stick to the ramekin, or worse, break it or fall apart. If you grease the ramekins well, all you will have to do is run a sharp knife along the edges and the cakes will come out perfectly! Let the cakes cool for a minute or two before flipping. That way they can set slightly and will be less likely to collapse once you flip them. Don’t let them cool too much though, as the warm center is what makes them so delicious! Can I make molten lava cake in advance? Absolutely! That’s what makes them the perfect dessert for special occasions, as you won’t need to leave your guest waiting too long while you prepare dessert. The batter can be made and poured into ramekins 1 to 2 days in advance. Keep them in the fridge until ready to serve and then bake as directed. Let them come to room temperature before baking or add an extra 30 to 60 seconds to the baking time, if baking right out of the fridge, to account for the cold batter. Can I freeze molten cakes? You can freeze the batter (already divided into ramekins) and then thaw to room temperature when ready to bake. You can also freeze the baked cakes and then reheat in the microwave. They won’t be as lava-ey but still delicious, I’m sure! While these cakes are indulgent and delicious on their own, they are even sexier when topped with whipped cream or vanilla ice cream! Just make sure to add the ice cream when you are ready to eat, since it will start to melt immediately (as you can see in the photo above)! A dust of powdered sugar, some fresh berries and/or a drizzle of caramel sauce will give you that fancy restaurant look that is sure to impress. Grease and flour 2 to 4 ramekins (depending on the size of your ramekins). Reserve. In a large bowl, whisk together the egg, egg yolks and vanilla extract until creamy and pale. Add the dulce de leche and salt and continue whisking until smooth. Then, add the flour and gently whisk or fold with a wooden spoon, being very careful not to overmix. Pour the batter into the prepared ramekins, leaving a little space on top for the cakes to grow. Bake the cakes in the preheated oven for about 15 minutes or until the edges are set but the center is still jiggly. Remove from oven and let the dulce de leche cakes cool for about 1 minute. Run a sharp knife around the cakes and flip them into individual plates. Garnish with powdered sugar and fresh berries, if desired, and serve. EQUIPMENT - If you do not have ramekins, you can use a muffin pan instead. MAKE AHEAD - The batter can be made up to 2 days ahead and refrigerated. When ready to bake, bring to room temperature or bake straight from the fridge, allowing an extra 30 - 60 seconds because of the cold batter.